The 7th annual Potluck in the Park was held at the Dunham Tavern Museum. The potluck, which is one of the largest in the city, celebrated local food and neighborhood sustainability. The gathering included live music and family-friendly interactive entertainment. The event was sponsored by Sustainable Cleveland 2019, Cleveland Neighborhood Progress, Neighborhood Connections, Greater Cleveland Neighborhood Centers Association, and Ward 7 Councilman Basheer Jones. To lead by example, the Office of Sustainability develops policies and programs to embrace a culture of sustainability. Working with City departments and key external partners, the Office implements projects in the following areas, resulting in cost savings and sustainability benefits. This document provides highlights of the Sustainable Cleveland initiative since 2009, when it launched. It includes a section on measured progress, and many snapshots of sustainability work happening in Cleveland. Cleveland is the 13th city in the nation to receive recognition from STAR Communities for its participation in the STAR Community Rating System, which evaluates the livability and sustainability of US communities. When the US pulled out of the Paris Climate Agreement in 2017, it became clear that leadership from local government, businesses, and civic institutions was needed more than ever. Mayor Frank G. Jackson, along with 400 "Climate Mayors" across the country, re-affirmed the commitment to climate action. Progress has been made since the first Cleveland Climate Action Plan (CAP) launched in 2013. Carbon pollution has been reduced and water and air quality have improved while the economy has grown.The City has been recognized for supporting solar and wind energy. Over 70 miles of bike infrastructure has been installed and a bike share system was launched (UHBikes). The Cleveland Climate Action Fund supported over 50 resident-led, neighborhood-based projects. Dozens of organizations have implemented the Cleveland Tree Plan. Destination Cleveland reported that the number of Clevelanders who would recommend the city as a place to visit has more than doubled. This plan is about much more than climate change. 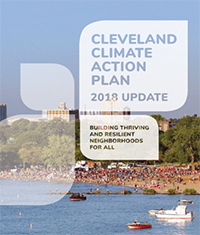 The actions in this plan are meant to strengthen the economy, clean the environment, and improve the health and wellness of Clevelanders.The work must be done in a way that ensures that those most in need enjoy the benefits of climate action. The Sustainable Cleveland Municipal Action Plan (SC-MAP) focuses specifically on municipal operations. The SC-MAP, in conjunction with the community-wide CAP, enables the City to lead by example while reaping the many known benefits of sustainability derived from increased efficiencies, reduced operating costs, and enhanced services. The City of Cleveland completed $4.5 million in energy efficiency and conservation projects funded by federal Energy Efficiency and Conservation Block Grant (EECBG) funds. These projects are moving Cleveland toward Mayor Jackson’s sustainability goals. Cleveland Energy$aver, which began as an EECBG program, is a turnkey, low cost, high impact residential energy efficiency package that can save homeowners $300 to $1,000 per year on their energy bills. The program is also open to landlords. The Downtown Recycling Pilot Project included the purchase of 70 recycling stations placed throughout downtown Cleveland. The Lake to Lakes Bike Trail between the Shaker Lakes area and University Circle was finished in Fall 2012. The Bike Rack, partially funded by the EECBG program, opened in September 2011 in downtown to provide cycling commuters with a locker room, bike storage, and repairs. The City completed HVAC Upgrades at 14 fire stations to provide more energy efficient infrared heating in the apparatus bays and garages. Housing Deconstruction pilot for 22 properties on the City’s list for demolition prevented usable building materials from going into landfills. Energy Audits were performed for 25 of Cleveland Public Power’s commercial and industrial customers. Lighting Retrofits were implemented at 16 City facilities (health centers, police stations, fire stations, recreation centers) across Cleveland to install more energy efficient lighting fixtures and bulbs, with anticipated annual savings of more than 3 million kilowatt hours. The City completed the Sustainable Cleveland Municipal Action Plan and the citywide Climate Action Plan. The LED Street Lighting Pilot helped determine which types of LED technology provide the best value (cost, energy savings, etc.) to the City. The City purchased and implemented an Energy Data Management System (EnergyCAP) to better manage utility consumption and costs, while tracking reductions and cost savings resulting from energy and water efficiency projects. A solar thermal domestic hot water (DHW) heating system was installed at the Collinwood Recreation Center. There are many simple things that can be done at home, at work, and in the community to save money and be more sustainable. Participate in Sustainable Cleveland 2019! Turning down the thermostat by one degree in winter cuts heating bills about 3%, and turning it up one degree in summer cuts air conditioning bills around 5%. Replace refrigerators with ENERGY STAR qualified brands. Take reusable items like cups, plates, and utensils to work. Save energy by shutting down the computer before going home. Use both sides of paper when printing – save toner and electricity. Carpool, use public transportation, or ride a bike to work. Meet via telephone, conference call or other forms of communication to save energy and time. Additional simple steps to taking action at home, at work and in the community may be found on the SustainableCleveland.org website.